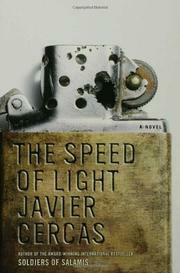 A Spanish novelist writes a novel about a Spanish novelist telling an American Vietnam vet’s story, which may be apocryphal. “All novels are autobiographical,” writes Cercas. Like his unnamed narrator, Cercas taught at the University of Illinois and published a successful novel about the Spanish Civil War (Soldiers of Salamis, 2004). Eighteen years ago, in Urbana, the narrator met Rodney Falk, a one-eyed, misanthropic survivor of two Vietnam tours. When Rodney disappears, his father gives the narrator three file boxes of Rodney’s letters, implicitly asking the narrator to write Rodney’s life. Back in Spain, the narrator does research, but can’t write. Years later, when the narrator’s Civil War book becomes popular, Rodney shows up in Spain with a warning about success the narrator doesn’t heed, thus losing his wife and child and becoming as catatonic as Rodney used to be. Finally writing The Speed of Light (part autobiography and part biography of Rodney) saves the narrator’s life. To reinforce the illusion of autobiography, Cercas uses a self-limiting nonfiction style—a pedestrian language that tells and analyzes rather than shows. But the guilt of Vietnam as a metaphor for the horror of succumbing to celebrity? Another non-American writer might get away with that, but Cercas doesn’t. In this game with and against readers, the novelist has tied one artful hand behind his back. Trouble is, the hand in front mostly points at himself, whomever that might be.